The reason that rely came loose was because of the vibration from the sub. I still do not see how you can enjoy the bose system. The system is designed for the bass and highs to fade out at higher volume, they did this because of 2 things. One is they do not want the speakers do distort and at all, and 2 they know that the small tiny little sub amp can not rely power a sub let alone there own. They have been doing this for years. I could put a 1200 dollar system in any car and blow the bose away maybe even less. Just my observation and my 2 cents. can someone give me a more detail as to how i can get to this amp. thanks. Brand new to the forums, and already this site has been tons and tons of help. To help this thread out a bit I found a simple clean how to removal/replace guide on the sub amp. I'm not claiming its mine just a simple google search brought this up. I just finished "fixing" the sub amp so I took some pics of the little grey box and the inside of the actual amp itself. Can't wait to have some funds to put in a real system. I've had my zr for nearly 2 years now, purchased with 36k on it, now has 95k. I've taken the sub and sub amp out twice simply reconnecting the connectors to make it not cut out(sub quits). It only repairs for a day or so. I've used Deox when working with electronics in the past, requested a bottle from a couple of friends who still work with the electronics company where I worked for 13yrs. Trouble is that was 10 years ago and these two always claim to be out when I see them from time to time. Told my oldest son about the trouble, he said I could get it from radio shack. Sure enough, 15bucks and it comes in a spray bottle with two, tin pin connections and gold. After I resoldered the relay to the board with no luck I removed the grey cover from the relay and spayed deox in the relay and left the cover off and the metal shields off. The z uses tin pins on the circuit board so now I have a tiny bottle of gold spray maybe I'll use some day. Just simply disconnect the connectors and spray the deox on both the pins and the plug and it's fixed. Radio shack has it label deoxit. Has advertising on the package for use on computer cords. Deox is nonconductive so no need to worry about overspray. 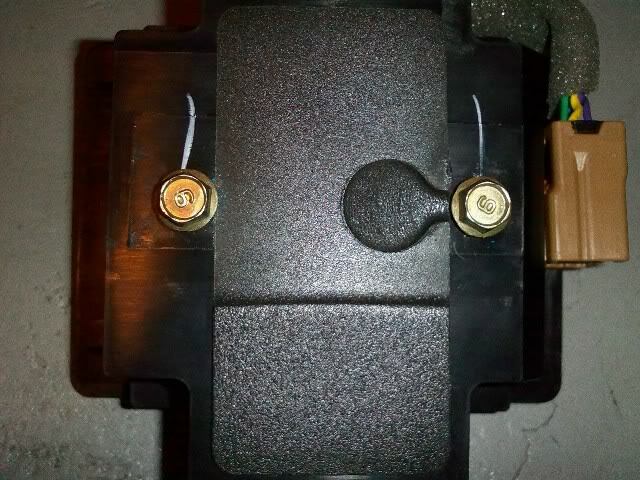 Next time my airbag light comes on I'll zap the sensor beside the hood latch but with the battery disconnected before unplugging that sensor. Last edited by simplewon; 04-20-2010 at 08:41 AM. I guess this was the answer I was loooking for thanks, Ive been having this issue for ages, it was driving me nuts. So once you open up the silver housing what exactly do you do to the little grey box? someone said apply pressure to it? is that right or do you open up the grey box and tinker? Thanks for that I will definatley give it a shot, does it require a lot of pressure ? (ie a big wad of paper!) or light pressure, might try using a small block of wood, less likley to dislodge. My 350z pet peeve will now be fixed!!!!! Last edited by WhiteNoiz; 08-21-2009 at 10:03 AM. The paper idea is a great one, I did this myself yesterday. The only issue was that it was a pain to figure out how much paper I needed to wodge in there to get it to work so. 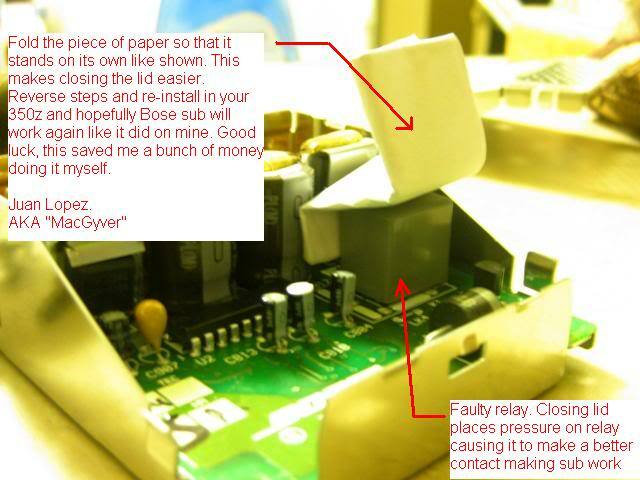 I tried several times to get the right amount of pressure but it seemed like the paper was not exerting enough force so..., (now this sounds drastic but worked great) I drilled a small hole in the housing above the relay (obviously the circuit board had been removed from housing first!) then found a bolt, re-assembled the unit and just screwed down the bolt until it applied enough pressure on the top of the relay to get it working (whatever you do if you try this DO NOT USE A SCREW as this will puncture the relay and could cause permanent damage). My other concern with the paper method is I had no idea how much heat was likley to build up in the unit after operating it for lengthy periods and didn't feel like taking a chance on having the paper ignite. Hope this is found to be useful.. If I ever take it apart again I will post some pics. Dude, you rock. This fix was simple and it worked. I was just about to waste money by replacing the amp and speaker. 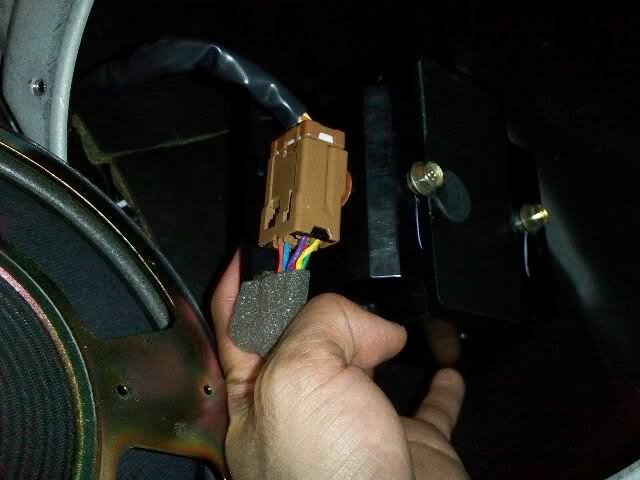 Thanks for posting this fix, it really works, I was about to dump the bose sub and amp and get new one. I dirlled a hole on the outer cover and screwed a screw in until it applied pressure on the grey box. Used a flat end screw the metal kind. I just have to chime in and say it worked here too (so far). At least until I can find a decently priced replacement or figure out a better amp/speaker solution. Just joined the forum and this has been a wealth of information already. I hope my post helps. Remove subwoofer cover on top left corner. Insert a flat screw driver and it just pops off. Shown are the subwoofer and sub-amp. 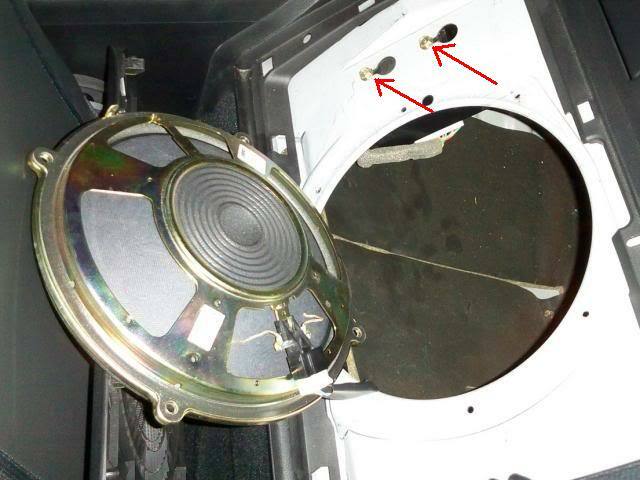 Remove the 4 screws on the subwoofer. You do not have to remove the subwoofer if you do not want to. You just need access to the sub-amp. 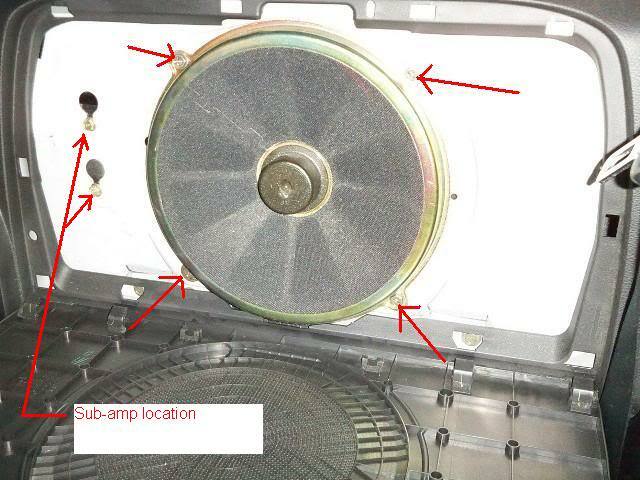 Lower the subwoofer as shown. 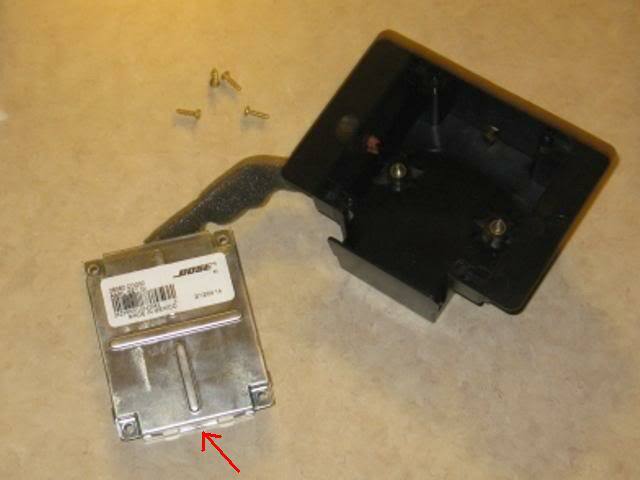 Slightly unscrew the sub-amp screws, but do not remove them. Lift and pull out the sub-amp. Disconnect the male and female connectors to the sub-amp. View of the sub-amp. Its very small. 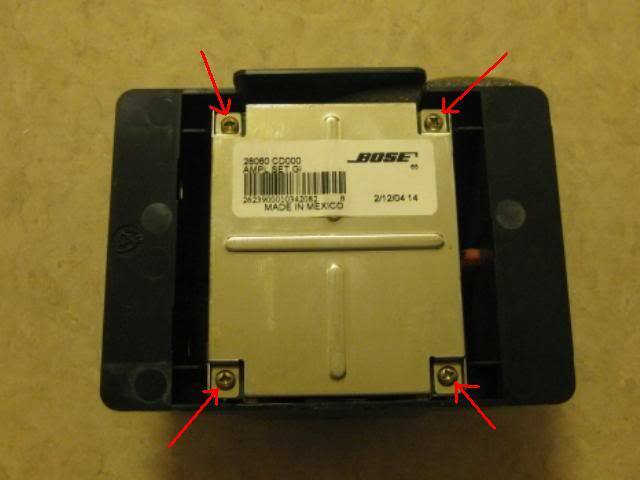 Turn over the sub-amp and remove the 4 screws shown with the red arrows. One you remove the 4 screws take the sub-amp out of the black plastic box. You do not need to disconnect any cables. Open the sub-amp with a small flat head screwdriver where the red arrow is shown. The sub-amp opens up like a car hood. 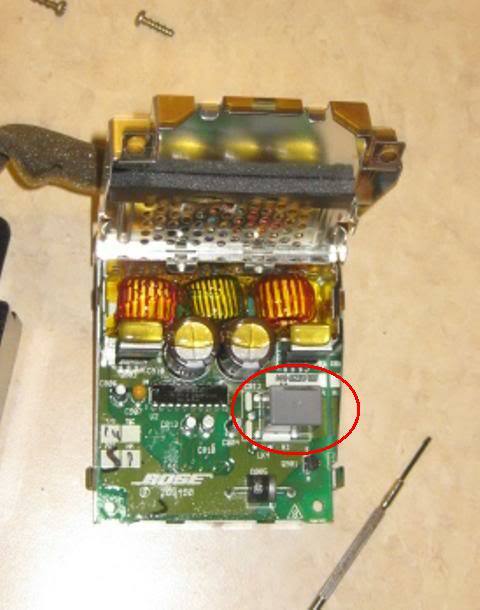 Shown in the red circle is the faulty gray relay that we need to put pressure on. Next place a piece of folded paper on the relay. 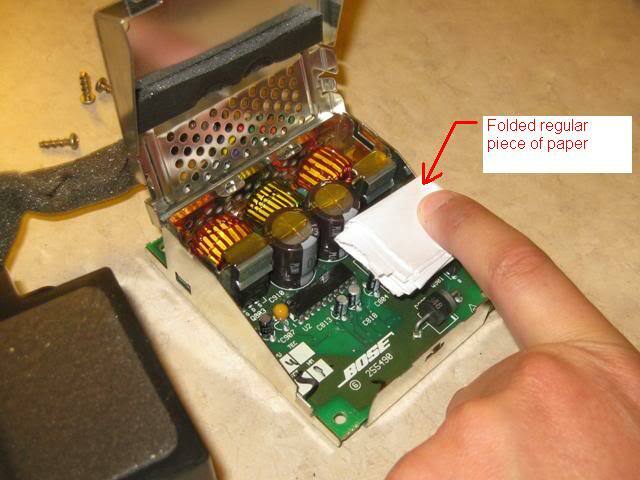 When you close the sub-amp (lower the hood) the piece of paper will put pressure on the gray relay making better contact. From what I read pressure varies from person to person. Some might need slight pressure, other might need lots of pressure. Add folded paper accordingly. I folded my piece of paper in such a way that it stayed in place without me having to hold it. This helps a lot because trying to hold it and "close the hood" at the same time is difficult. This just makes life easier. I hope this helps out people. It was a major headache but now it got fixed totally free. If your Sub still cuts in and out try adding more paper or maybe you'll have to bite the bullet and buy a new sub-amp. Yay!! !, my sub works now. I don't think it ever work since I bought it 3 years ago. I was thinking the whole time how crappy the Bose system was and how little to no base it created. Now my system actually sounds decent. I can't imagine the next person that ever gets this car will find all these random crap I have done to fix this car like this trick or the penny trick I did in the hatch to make it pop higher. I had that issue with the front lefts, turned out to be the Bose HU though. had the same issue with the HU, took it back under warranty then decided to buy a new HU all together. When i play CD, bass drop out. However, its ok when i listen to radio. ??? I removed the audio deck once. I think i might have got some wire loose or something. i can't think of any other reason. I tried applid pressure to the grey box but doesn't work. man, the bass drop out is driving me nuts.